We all know what they say about the early bird, and if you ran with us this past Saturday, you definitely earned your worm! Not just because our finisher medals had a worm on them, but because you battled strong wind and cold temps at the inaugural Early Bird 10 Mile Run presented by Nebraska Medicine. 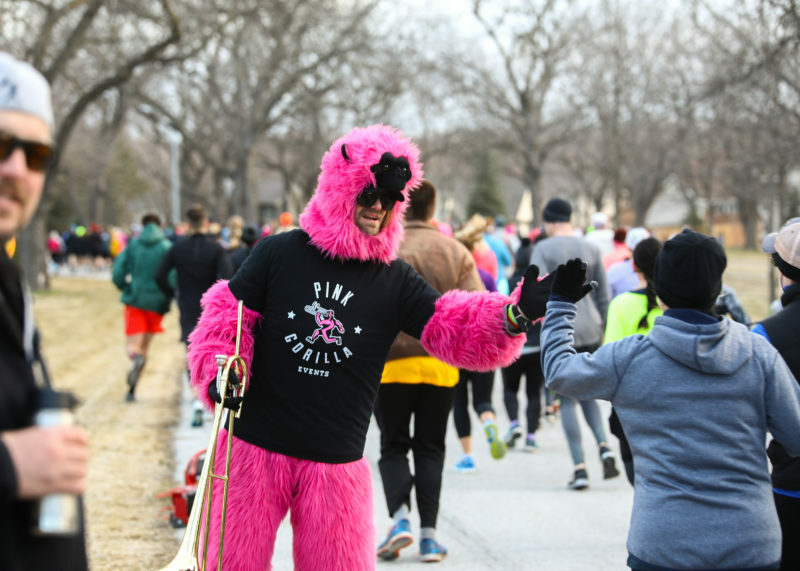 As the race director for Pink Gorilla Events’ first new race in almost four years, there were plenty of highlights, along with a few stressful moments. No event would be complete without a little stress and even less sleep, but our team loves what we do and it’s all in the name of producing big experiences for runners! Seeing a plan come together: A new event means new venues, new logistics to work out, new site maps and volunteer plans to be developed. All-in-all our team spent nearly nine months and hundreds of hours preparing to make the inaugural Early Bird the best event it could be. And by-all-accounts, from early packet pickup to race day parking and bag drop to traffic control, right through to the finish-line and brunch, the plan came together and was awesome to see first-hand. Even more satisfying was to watch those first 5-star reviews roll in on Facebook, it’s a very rewarding feeling given all our team’s hard work. Brunch. It’s one thing to plan brunch in a park that has absolutely no power sources for 2000 runners, it’s an entirely different thing to see it in action and come together. Yes, the wind may have been strong, but that didn’t stop our friends from Early Bird Brunch, Archetype Coffee and Barefoot Bubbly from serving up one of the most amazing post race brunch spreads I have personally ever seen at an event. Volunteers. We say this at every event we produce, (speaking of which, did you know we produce 8 events annually in Nebraska and Iowa!?) but our events truly would not be possible without all our awesome volunteers on race day! It took nearly 200 volunteers to make this event a reality and if you thought it was cold running, try standing still for 4 hours. They did awesome! From the Fleet Feet Motivators to our group of high school students handing out medals and cheering in every last runner, we can’t thank them enough. An extra special shout out to the GOATZ volunteer group at Water Station 3, they may have had the coldest job of the day, right on the lake, handing out water with a North wind blowing across the lake into their faces! Company Founder filling potholes and removing road kill: Ben Cohoon, the original founder of Pink Gorilla Events, is typically in charge of the course at most of our events. For this particular course that meant spending the entire day Friday filling pot holes on the course with cold patch. Some so big they took nearly 100 pounds of cold patch! He also had the pleasure of removing an opossum from 156th St on Saturday morning. Let me assure you, it wasn’t playing opossum. Battening down the hatches: Both at 6 AM and again right after the race started our team was scrambling to find every piece of weight we could to weight down all our equipment. From tents and flags to the arch and crowd control fencing, surprisingly we have a lot of things that can blow away in the wind! And while a section of fencing did blow over and we had three sponsors lose their tents, I’m just glad none of the porta potties blew over on anyone! All in all, it was an awesome first year for our runners and for us at Pink Gorilla Events. We can’t wait to fly with you again at the 2019 Early Bird!